Support Your Local East Texas Farmers! East Texas – Americans now more than ever are becoming increasingly concerned about what’s on their platter. As demand for locally grown fruits and vegetables has increased, so has the number of urban farmers markets sprouting up across the nation. You can know where your food comes from by visiting with the farmers at your local Farmers Market. Farmers’ markets are one of the oldest forms of direct marketing by small farmers. United States Secretary of Agriculture Tom Vilsack proclaimed August 5th through 11th, 2012 as National Farmers Market Week. Since 2000, when the United States Department of Agriculture (USDA) first proclaimed National Farmers Market Week, the number of farmers markets has grown an estimated 170%, from 2,863 in 2000 to over 7,800 in 2012. As these numbers increase, farmers markets are bolstering local economies, improving community health, and bringing diverse groups of people together through a shared social space. In a farmers’ market, a group of farmers sell their products once or twice a week at a designated public place like a park or parking lot. Some farmers’ markets have live entertainment. Shopping at a farmers’ market is a great way to meet local farmers and get fresh, flavorful produce. MYETX encourages East Texans to support their local farmers and buy fresh! Athens – The ATxFM is a non profit organization that provides a local venue for fresh veggies, fruits, breads, & homemade crafted items. The market has been created & is run by Athens women with a passion for the community & a desire to keep the market alive! Locally grown produce and home-made goods ranging from crafts, breads, jewelry, and other foods. Farm fresh eggs, be sure to ask about organic and free range! !The Athens Farmers Market runs from 8a-12p each Saturday May- October. It will continue November- April on each First Monday Saturday. Located at 212 N. Palestine Street in Athens. Beaumont – The Beaumont Farmers Market is a place for the community to meet and to support their local farmers. Vendors are all within a 150 mile radius of Beaumont, TX. Opens in April, every Saturday from 8:00-10:00 a.m., through November. Located at the Athletic Complex on the south side of College under the basketball court. 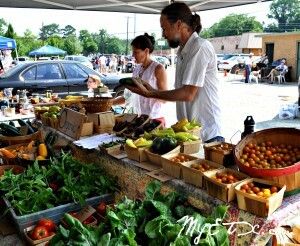 Jacksonville – The Jacksonville farmers market is located at 1836 S. Jackson Jacksonville, TX. Hours are – Monday-Saturday, 8:00 a.m.-6:00 p.m. Takes WIC, SFMNP. Jasper – Jasper Master Gardeners manage the Jasper County Farmers Market Saturday mornings during the growing season, May – July and September – November, 8 to 11 a.m. near the intersection of Hwy 190 and 96 in Jasper. The last market in November is a Holiday Market combined with the Chamber of Commerce’s Christmas in the Park—food, music, crafts and more; call 409-384-3721 for details. Kemah – Kemah Farmers & Open Air Market – Located at 204 FM 2094, in Kemah. Livingston – The Livingston farmers market is located at 111 U.S. Highway 59 North Loop Livingston, TX 77351. Hours are April-November Tuesday, Thursday & Saturday, 7:00 a.m. to 12:00 p.m. or to sell-out. Accepts WIC. Lufkin – The Lufkin Farmer’s Market is open and has fresh produce! A variety of seasonal fruits and veggies, jellies, pickles, soap, fresh baked bread, local honey, nuts, farm fresh eggs, flowers, herbs and plants. Also California tomatoes, new potatoes, yellow and purple onions, sweet potatoes, fig preserves, pickled okra, pickled squash, pepper relish, ribbon cane syrup, and Mexican vanilla! Located at 2107 S. Medford Dr.
(Exit 69 off Loop 287 in Lufkin). Open Monday-Friday, from 8 a.m. until 5:30 p.m., Saturdays from 8 a.m.- 5p.m. and Sundays from 10 a.m.- 4 p.m.
Marshall – Seasonal open air market featuring fresh produce, locally grown by Harrison County Farmers. Located at Wellington Street, one block south of the Harrison County Courthouse and town square in Marshall, Texas. Open Tuesdays, Thursdays and Saturdays, 7 a.m. – sellout, May through August. Mineola – Every Saturday morning at 7:30 a.m., farmers and artisans from Wood County and surrounding areas arrive at the pavilion on Front Street in Mineola to the sound of music. Nacogdoches – The Nacogdoches Farmer’s Market is located near the red brick streets of historic downtown Nacogdoches, at the old “hitch lot.” Local organic produce, flowers, plants, baked goods, eggs, jellies, relishes, canned goods, honey and locally produced crafts. Sat:8:00 am-12:00 pm and Wednesdays from 3 p.m. to 7 p.m.
Palestine – Seasonal market, open daily or when vendors are available, between West Oak and West Spring streets beside the Palestine Visitors Center. Paris – The Paris market offers a variety of items including specialty breads, locally roasted coffee, fresh produce, fresh eggs, goat cheese, pottery, firewood, and Texas Wine. The market is open Monday – Sunday from 8 a.m. to 6 p.m. Located at the 400 block of First Street South West as the Market Square. Sulphur Springs- Known as “The Market” and located downtown in what is called the Bright Star district. “The Market” moved from Main Street to the Square in mid-July. Currently, the farm and art market is open from 7 a.m. until 1 p.m. every Saturday, May through October. Texarkana – The Texarkana, Texas Farmers’ Market located at 305 Texas Blvd in historic downtown Texarkana is open from May through the summer on Saturdays, Tuesdays, and Thursdays from 7am until noon or sold out. Now accepting debit and SNAP cards! Featured items include fresh fruits, vegetables and herbs, plus crafts, baked goods, eggs, meats, home-canned items, tomatoes and much more. Tyler – Tyler has TWO Farmers Markets! East Texas State Farmers Market is a local market located at the East Texas State Fairgrounds, now known as The Park Of East Texas. It is a market place for local fruit and veggies as well as homemade arts and crafts. Opens the first Saturday in May and closes the last Saturday in July. If you know of an East Texas Farmers Market that is not included in this list please send our team information at myetx.team@gmail.com. Or simply reply at the bottom of this post. ELKHART- Starr Cemetery is located atop Starr Hill just north of Elkhart, in Anderson County. 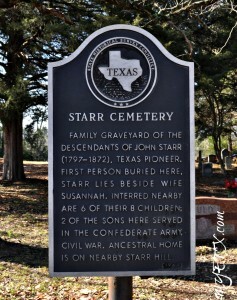 The cemetery is the final resting place of the descendants of John Starr (1797 – 1872), Texas pioneer. John Starr was born in Rowan County, North Carolina, Aug. 29, 1797. He married Susannah Parker, sister of Pilgrim Church organizer Daniel Parker. NACOGDOCHES- With the 10th Anniversary of the space shuttle Columbia disaster this Friday, February 1, 2013 members of the Nacogdoches community are doing their part to honor and remember the tragedy. 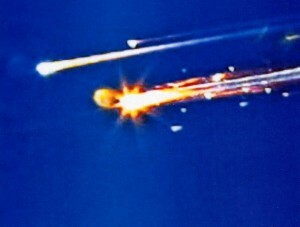 The space shuttle Columbia was the first shuttle of NASA’s orbital fleet to be capable of space travel, and it completed 27 missions, before tragedy struck during re-entry on its 28th mission. 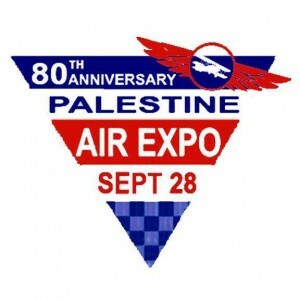 PALESTINE- The Experimental Airport Association Chapter 1549 (EAA) will host the 80th Anniversary Celebration for the Palestine Municipal Airport. The chapter’s first event is scheduled for Saturday, September 28, with festivities kicking off at 10 a.m.